Hiboutik offers different discount features to manage discounts in your account. Some security rules (restrictions, codes…) ensure that only authorized people can apply customer discounts. In Settings/Discounts, you can create different types of discounts, either in amount or in percentage. The discount label is the name of the discount displayed on your sale interface (ex: VIP). The value is a negative integer (ex:-10), linked to a currency (for a discount in amount) or a percentage. To apply a line-item discount you must be authorized to modify prices in sales (right to enable in Settings/Users/Access Management). To discount a product line, select the product in the sale. In the left side of the sale, you can select a discount type. The discount is applied to your product price and the discount value is displayed bellow your product line. For free products, a “complimentary” button is setup by default. On the main page of your sale interface, just under the product keys, you will find the different discount buttons you have setup in Settings/Discounts. To apply a discount to the entire sale, click on one of these buttons. A line-item discount is automatically deducted from the product price. On the contrary, a sale wide discount adds a new negative line item into the ticket. A sale wide discount in value must be greater than the total value of the sale. To make a sale wide discount, you can also use the unknown product code. You can type this code (#r# by default) in the “Add a product” field in a sale, followed by the discount value. A new line item is added to the sale with the discount amount. Ex: for a 10$ discount you type #r#-10; or #r#-5% for a 5% discount. You can modify this unknown product code in Settings/General settings. Important: a sale wide discount is always linked to the default sales tax of your account (Settings/Sales taxes). So be careful if you have products with different sales taxes in your sale. In each product form, you can set a discount price. 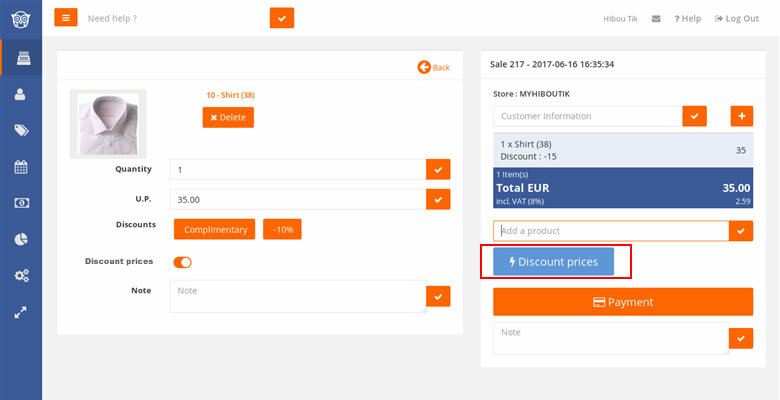 During sale events, a new button (“discount prices” or “Happy-hour”) is displayed on your sale interface, to apply the discount prices on sales. You can set up sale event dates and happy-hour time in “Settings/Sales period” or “Settings/Happy hour”. 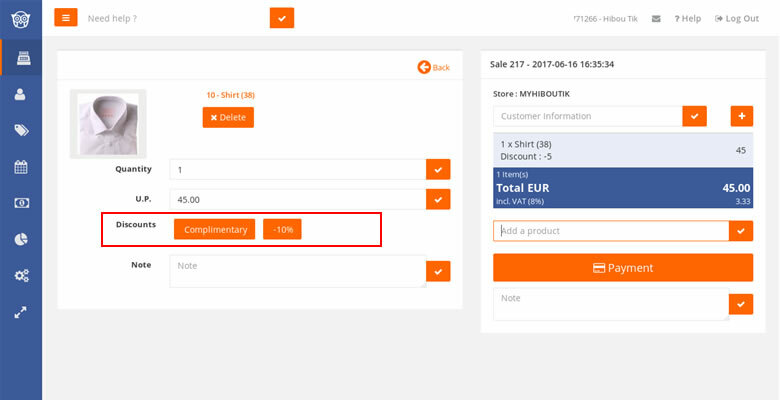 In your Hiboutik POS software account you can easily manage discounts. In the monthly synthesis, you can download a detailed file of your sales. Line-item discounts are reported into the “Discount” column, and sale wide discounts are identified under the “Discount/Unknown product” item.